Uttarakhand Public Service Commission (UKPSC), Haridwar has released an advertisement for the recruitment of 30 vacant seats of Civil Judge (JD) 2018 Examination. 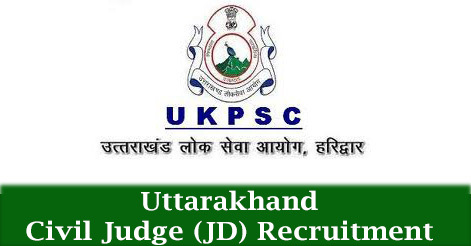 UKPSC invites application from the eligible candidates to fill 30 posts under Civil Judge (JD) 2018. Interested candidates may apply online from 05 October 2018 to 17 January 2019 (Updated). A Bachelor of law from a University established by law in Uttarakhand or by other University of India recognized for this purpose by the Governor. Examination Centres: Haldwani, Dehradun & Haridwar. Candidates will be selected through Pre, Main Exam and Interview conducted by UKPSC. Interview: The marks obtained in viva-voice will be added to the marks obtained in the written papers and the candidates place will depend on the aggregate of both. Interested and Eligible candidates can apply online through the official website www.ukpsc.gov.in from 05 October 2018 to 17 January 2019 (Updated). New users have to register themselves through OTR (one time registration) in the UKPSC official website and then apply for the post. Candidates who have already registered should login with their user id and password and apply for the relevant post. Help us to improve this article/job posting "Uttarakhand Civil Judge (JD) 2018 Recruitment". We would be glad if you can comment below and provide your valuable suggestions and feedback. If this page have any wrong information/list or out of context content, then you can report us as well. What is the exam date of the uttarakhand judicial service examinination? What is the date of UTTARAKHAD JUDICIAL SERVICES EXAM 2015? when civil judge exam date plz nottification date.plz send my email id. What is tentative date for UKPSC CIvil Judge Junior Division Exam 2017? Admit card downloading date is….???? what is the expected result date of prelim exam? WHAT IS NAME OF COUNCIL?? Is it also for science student!! Kindly let me know the date of prelims. And it possible, of mains also. Anyone, please! What is the date of Uttrakhand civil judge 2018 pre exam? It is not for the science students unless if u complted ur llb after that….but the main question arises when will be the preliminary exam of UK held? how we submitt our pcs j fee..
and how we check my form submitted successfully or not…? what is the exam date of latest recruitment i.e. for which application filed on 17.01.2019. What’s the expected date for ukpsc j exam 2019?? Person from another state can give this exam?? IF he/she is interested in that!! What is the fresh date of exam 2019? What is the date prelim exam?